SriLanka Holiday - Do not trust anyone in Sri Lanka! Do not trust anyone in Sri Lanka! S100 – All over the world all prices are increasing. But there is a small country in the Indian ocean where the prices are decrease. The country is Sri Lanka. Sir Lanka got 2015 a new government. The government has decreased the price for the most important thinks people in Sri Lanka need. For rice, dall and petrol. The petrol costs where in 2014 about 180 LKR per liter, now 120 LKR. With the petrol costs the government has also decreased the Tuk Tuk taximeter price in Colombo. In Colombo the price for Tuk Tuks are regulated by the government. The base price for the first kilometre is 50 LKR (also if you drive only 500 meter). Per kilometre over 1 kilometre every kilometre costs 30 LKR. We travelled last year for 2 months to Sri Lanka for studding the Sri Lankan language Sinhala. For this we were looking for a long stay accommodation in Galle Sri Lanka. We found really nice family where we have rent the whole first floor. Our host family Rincy and Heman are very polite and helpfully people. Thy show us where we can by all things and food very cheap and so we saved some money. If you are tourist in Sri Lanka of course you have to pay more for a transfer with a Tuk Tuk then the local people. But don’t pay to much! 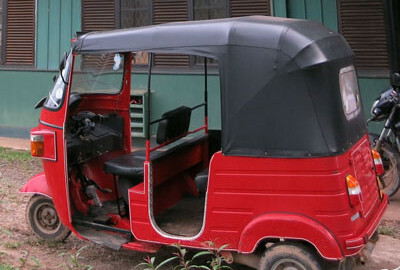 If you need a Tuk Tuk in a tourism area then you have to pay about 200 till 400% more than the normal price. You have to negotiate with the driver before you start! Regular price per kilometre is 40LKR one way! If you need also the turn back it must be lower. If the driver is waiting for you, not pay more than 200LKR per hour! Tuk Tuk driver in tourist area are not poor! Might the look poor but the most of them are very rich. At the high season a TukTuk driver in a tourism area earn about 3000 till 5000 USD! Please don’t pay to much. If many tourists pay to much the prices for tourists increasing very fast. We the tourist have also work for our money. Sri Lankan TukTuk driver think, all tourist a very rich. Especially in special tourism areas the price is very high, for example in Unawatuna or in Mirissa.